An introduction to one of the most popular plants in cultivation, for both pot culture and landscaping, throughout the world. 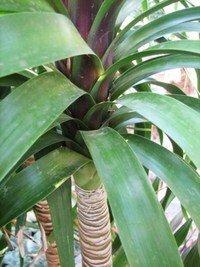 As you can tell by touring the PlantFiles here at Davesgarden.com, Beaucarneas and specifically Beaucarnea recurvata are very popular plants (one of the top 10 most photographed plants). There are comments and photos from all over the world in this website. 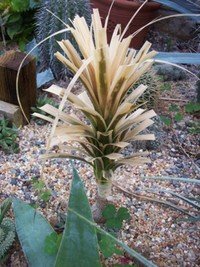 In the colder climates Beaucarneas are very commonly grown potted plants. They are able to survive and thrive in a variety of conditions very different from their native dry, sunny, desert-like Central American orgins. Needing little care and tolerating a huge amount of abuse, even those with 'brown thumbs' can often keep this one alive for years. 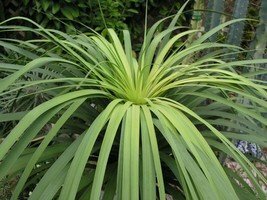 In the more suitable warmer climates throughout the world Beaucarneas are some of the most carefree of all landscape and outdoor potted plants. 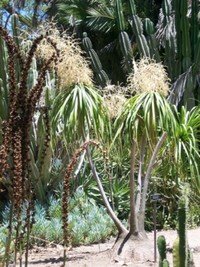 The following is a review of its relationship to other plants, a discussion of its care both indoors and in the garden, and a brief synopsis of the more common species in cultivation. 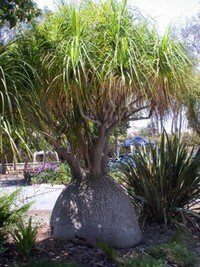 Beaucarnea recurvata is also known as the Ponytail palm, Elephant foot tree or Bottle Palm. 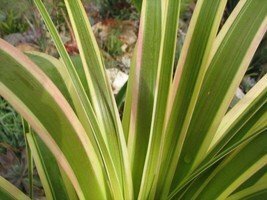 These names have also been applied to most of the other commonly grown Beaucarneas as well. 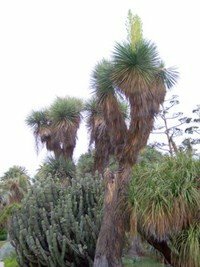 However, they are not palms, or even closely related to palms, but members of the Agave family- or at least they used to be. These poor plants have really gone through the ringer when it comes to classification, though, with some botanists putting them in the Lily family, and others putting them in the family Nolinaceae. 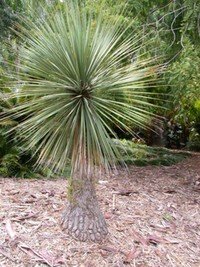 Many references will use the genus Nolina, not Beaucarnea, in fact (so when looking online for information on these species, one sometimes has to search Nolina as well as Beaucarnea). Here in Davesgarden they are placed in yet another family: Ruscaceae. This is the most recent classification, which now groups a large number of seemingly unrelated and vastly different plants (both in appearances as well as cultivation) based on DNA and lack of some pigment in the seeds. So according to this last taxonomic revision, Beaucarneas are NOT that closely related to Agaves. Sigh. 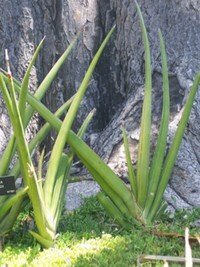 But for purposes of this discussion we will simply consider them agave relatives. 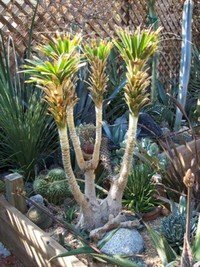 This is helpful as their care is not that different from what it would be for most Agaves. Beaucarneas are for the most part from Mexico, though some species are from other Central American countries. 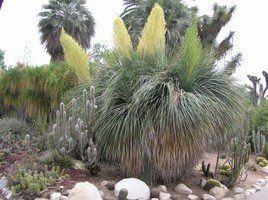 They are very closely related to another Mexican genus, Nolina, or the Bear grasses. 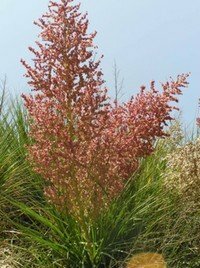 Nolinas are very similar plants- both Nolinas and Beaucarneas are stemmed, woody succulent shrubs or trees with leathery grass-like leaves. These are flowering plants and are dioecious (have male and female flowers on separate plants). 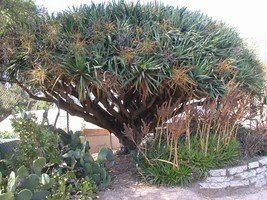 Other close relatives include some other drought tolerant succulents such as Calibanus and Dasylirion, also from the Americas, as well as Dracaena and Sansevieria from the other side of the globe. Some genera that seem totally unrelated, but also in the same family, Ruscaceae, are Liriopes, Aspidistras and Mondo Grasses. One of the most interesting characteristics of Beaucarneas are their swollen bases. 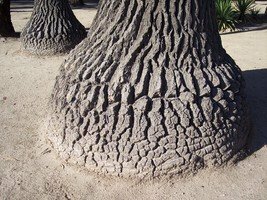 This swollen trunk is basically a water storage structure enabling these plants to survive long periods without any water. This water storing capacity is also what makes these plants ‘succulents’. In general, the older the plant, the larger the base will become. 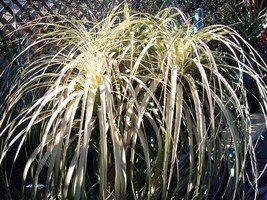 However, if raised indoors in a low light situation and kept on the dry side, these plants can sometimes grow somewhat spindly and not form the huge swollen base that makes them so attractive. If given enough water, light and fertilizer, all the Beaucarneas will develop at least some moderate swelling of their trunk bases. 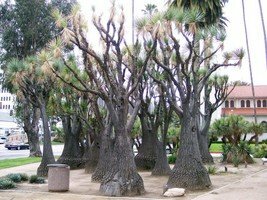 The woody bark can also be an ornamental feature of these plants with some species having marvelously fissured structures than can look like sculpted spheres with large, irregular plaques of thick bark applied like a woody mosaic. One of the ways to distinguish between several of the Beaucarnea species is from their leaf morphology. 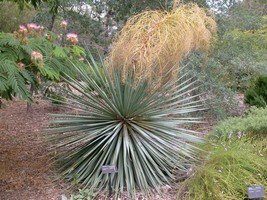 Each branch of a Beaucarnea ends in a tuft of grass-like leaves. These leaves vary in number, thickness, stiffness, color and length depending on the species. 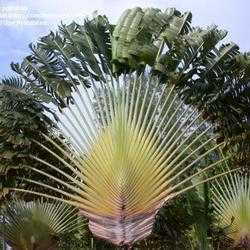 The most recognized species, Beaucarnea recurvata, is named after the shape of its leaves, which are long and ‘recurving’. 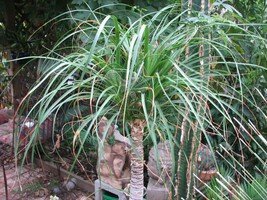 Beaucarnea stricta is named after it’s more ‘strict’ or stiff leaves. 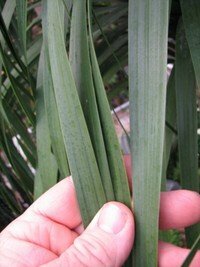 Beaucarnea gracilis has gracefully thin, glaucous leaves. 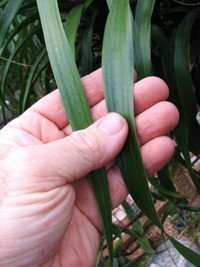 Some Beaucarneas have exceptional wide, twisting, trailing leaves (B guatamalensis) and some have sparse tufts of leaves (Beaucarnea goldmanii). The leaves continuously grow from the very tips of the branches and adhere to them fairly loosely in a overlapping manner. Eventually the older leaves die and fall to the ground. The leaves furthest from the growing tips are easy to peel off, and peeling off the oldest leaves enables one to keep the leafy rosettes ‘neat’ and tidy, exposing more trunk/branches, giving the plant a more sculpted appearance. 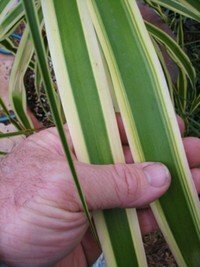 Beaucarnea recurvata is also available as a tissue-cultured variegated form, often called Beaucarnea recurvata albomarginata. 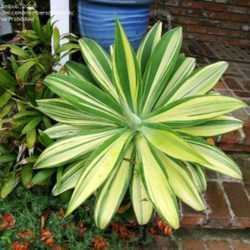 This from has a distinctive yellow striped down the sides of each leaf. Once extremely rare, these variegated plants are becoming more and more common in cultivation as rooted cuttings begin to flood the market. 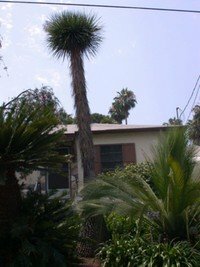 Most Beaucarneas have the potential to grow into large trees, though some get larger than others. 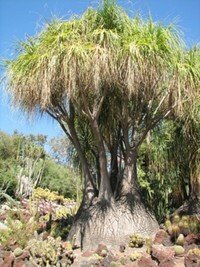 Beaucarnea recurvata can grow up to 30’ in the right climate and growing situation, with trunk bases over 15’ in diameter. 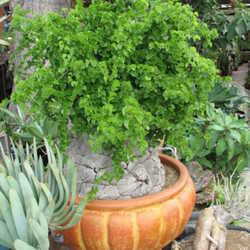 However, as house plants, most rarely achieve anywhere near this height or massive base. 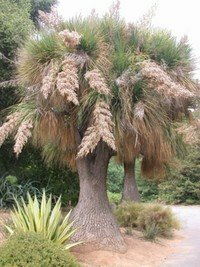 One species, Beaucarnea compacta, never gets any taller than its swollen base, having only grassy tufts growing out if it. 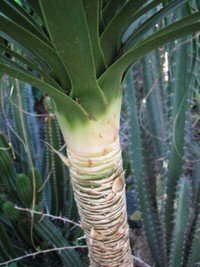 Nearly all Beaucarneas begin as single-stemmed, palm-like plants with a solitary rosette of leaves at the top of the trunk. Eventually it will branch, usually in response to either flowering or some injury to the meristem (growing center at the very tips of the stems). But it seems as long as it doesn’t flower or get injured, these plants will continue to grow as single-trunked plants. Eventually large, older plants will flower. Indoor plants will rarely, if ever, flower. 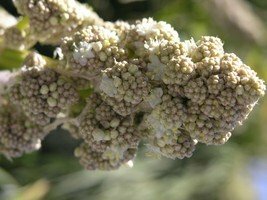 The flowers erupt from the very end of the stem on a large inflorescence, generally late in summer to early fall (though some bloom anytime but winter). These highly branched inflorescences bear thousands of minute pale yellow to cream colored flowers. As plants flower, the crown of leaves tend to become less than impressive. Flowering plants actually look somewhat sickly- many growers will cut off the flowers immediately to keep a fuller head of leaves on each branch. After flowering most plants will start branching at that point. Branches will also form after injury to the stem or meristem. Some growers will ‘injure’ plants purposefully to stimulate a fuller look by just cutting off the branches anywhere. 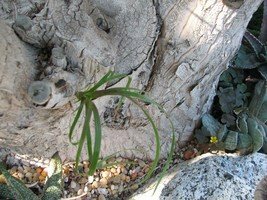 Branches also tend to grow out of the trunk base or along the stems, particularly, but not always, following some sort of injury to the plant in general (such as frost, fire, trauma etc.). Older inflorescences, that happen to get successfully polinated by bees, etc. will become orange-red structures from a distance. The seeds themselves are only 2-3mm but encased in flattish, colored husks which are designed to be carried off on the wind. Since you need at least two plants to have viable seed (dioecious plants), most landscape plants will never develop these orange seed structures unless multiple adult plants exist in the garden. 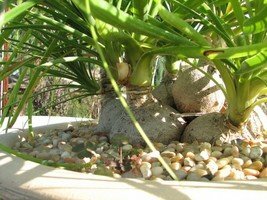 Beaucarnea roots are pretty tiny structures and add little support to the plants. The primary function of the roots is water absorption. 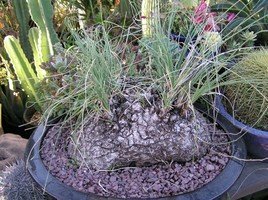 Roots are rather ‘disposable items’ and little or no effort needs to be done to preserve them if/when moving plants for repotting purposes, or moving about the landscape. 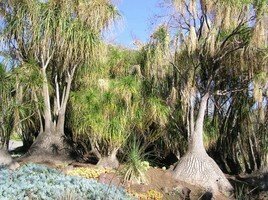 If planting a Beaucarnea it important to know that generally the most active roots tend to grow along the margins of the base, just at or below the ground level. 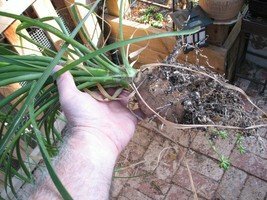 These roots need to be near the surface or they will quickly lose their ability to work properly and they may rot off. This is why one should never plant the trunk deeply in the soil- there will be few functional roots then, and the possibility or rotting the entire base goes up exponentially the deeper it is planted. Plant a base with half or less than half its surface below the soil- never more. 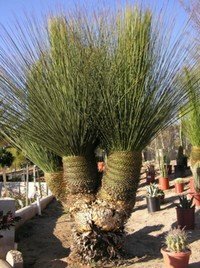 Most of the following comments will pertain primarily to Beaucarnea recurvata, for which there are far more experiences in a variety of cultivational situations. 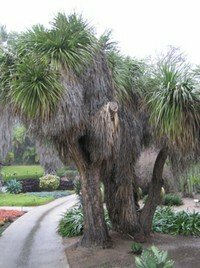 For the most part, the other commonly grown Beaucarneas have somewhat similar requirements but may be more prone to rot in wet situations as most come from even drier locations throughout Mexico and Central America and are adapted for even more extreme drought than is Beaucarnea recurvata. Though most Beaucarneas originate from the hot, dry desert Mexican climate, they are extremely tolerant of other growing conditions. 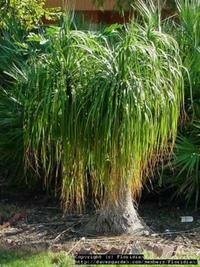 Beaucarnea recurvatas are very commonly seen in Florida, Hawaii, Australia and Africa, often growing in humid and very wet conditions. As long as the soil is well draining and the climate warm, these plants seem to tolerate an amazing amount of water. When conditions are right (warm and well draining soil) B recurvatas even seem to crave water, just growing faster and developing larger bases the more water they get. 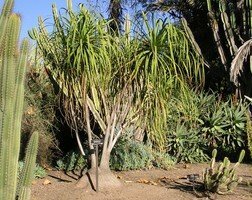 Outdoors in southern California overwatering these plants is nearly impossible, unless they happen to be growing in soils with exceptionally high clay contents and/or are poorly draining. However, plants confined to pots, particular if indoors, are much more prone to rot from excessive moisture. On the other hand they also succeed fairly well on very little water. They do tend to have some leaf drop in drought, and poorly watered individuals, particularly B recurvatas, can look spindly and almost leafless in extreme drought. 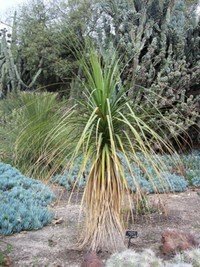 Rarely does drought threaten the life of a Beaucarnea, but it can make it look a lot less healthy. General recommendations are to water intermittently and deeply but let the soil dry out between watering. In the garden this is probably not often a realistic guideline. 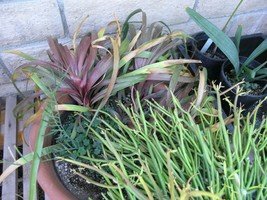 In suitable climate zones for these species, watering practices are much less of a concern as they are for potted plants, and much less care needs to be taken in making sure soils do dry out. I have multiple Beaucarneas in the garden and some get nearly daily water, while others get almost no water, and all are doing well. Try to avoid overhead watering when possible as that is one of the most likely situations that will allow bud rot (fungal infection of the growing meristem) to occur. Full sun is the preferred outdoor situation, but plants can grow in amazingly low situations and do well. These shaded plants do tend to get a bit ‘stretched’ or etiolated, and develop weaker trunks and branches. Plants grown in full sun tend to grow a bit squatter and more solid in structure, and are probably healthier, too. For potted plants, full sun can be a problem if moved from shade to sun seasonally. 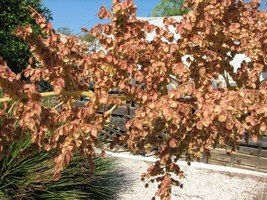 Sun will burn the unacclimated leaves, though that won’t hurt the overall health of the plant much. It is recommended to gradually move these potted plants from sun to shade, or always provide some protection from hot sun. Potted plants left in full sun situations quickly adapt, however, and new leaves will have no problems with all but the most extreme, hot sun in low humidity situations. 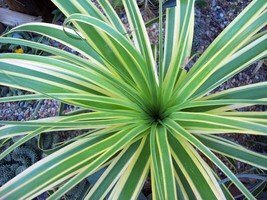 The variegated plants seem more prone to sunburn and will never completely acclimate to severe desert sun exposure. 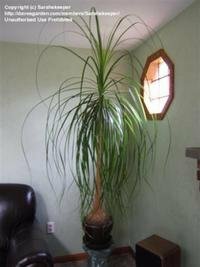 Indoor plants should be grown in the brightest areas in the house as possible to prevent weak, spindly trunk formation. Cold is probably the single most important limiting factor to consider when caring for these plants. Though listed as being able to survive temps in the low 20Fs or below, temps even in the mid 20Fs will usually defoliate Beaucarneas. Small plants may die outright from moderate freezes, but most larger plants will survive. However, subsequent rot following a freeze is a common complication if such injured plants are then exposed to cold, wet conditions. For garden or landscape plants that have had severe damage to the leaves, it is recommend all remaining dead leaves be immediately removed. Retained dead leaves trap rain water and allow for rot to begin traveling down the branches/stems. Injured potted plants should be moved indoors or under protected patios, if possible, and not watered for many weeks. 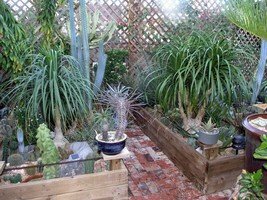 Moving plants that are potted or relatively small is a very easy procedure. Since most plants have small roots, it takes little effort to dislodge one. If some or all roots rip off, it will matter little as these woody caudeces can make new roots easily, as long as not buried too deeply. What one shouldn’t do, however, is damage the base. Injury to the caudex will greatly increase the likelihood of rot to occur, and often the entire plant can be lost. For moving very heavy plants, care must be taken not to dig into the bases, or injure them with shovels, picks or moving tools. 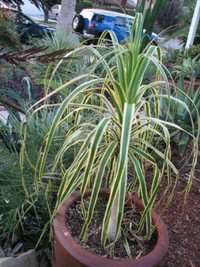 However, if one does injure a Beaucarnea base, all is not lost. Clean the injury, let it dry (so if below the surface, avoid replanting for a while) and apply some sort of antifungal powder and/or rootone. Try to avoid replanting for 1-2 weeks after the injury, and no water for maybe twice as long. These plants do not seem to be terribly needy when it comes to fertilization, though ‘some’ use of fertilizer is recommended… just be easy! Potted plants seem particularly immune to the effects of ‘lack of fertilizer’. For those plants, probably 2x a year liquid fertilization would be safe. 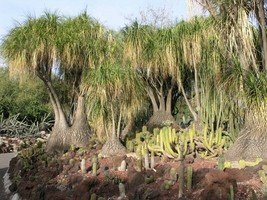 Germination of ripe seed is fairly straight forward and most have success with the standard germination practices for most succulents and cacti. One successful ‘recipe’ involves a 30% perlite/ 50% peat moss and 20% sharp sand mixture in small cups or cells, topped with some seeds, and topped once more lightly with a top dressing to keep the seeds in place when watering. Sew in spring and try to keep temperatures around 70F and soil somewhat moist (don’t let dry out too long). Seed should germinate in 2-3 weeks (but sometimes can take much longer). 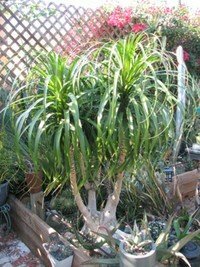 However, if one has a branching Beaucarnea, or knows someone trimming one, branches tend to be fairly easy to root. 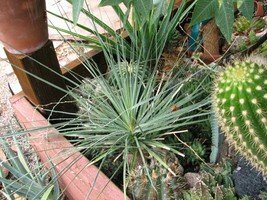 Remove most of the leaves first and stick the dried, treated (Rootone) end in a well draining cactus mix and try to avoid watering too much (none at first). Root formation usually only takes 2-4 weeks. 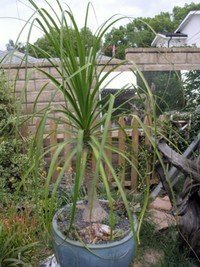 By far the most commonly grown Beaucarnea is Beaucarnea recurvata. 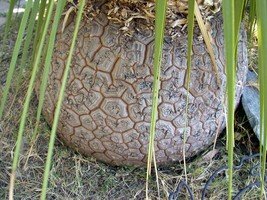 This is a fast growing plant with a moderately smooth caudex, until plants get substantial size (3’ diameter base or more)- then the caudeces are rougher and more textured. The stems/trunks tend to taper thinly above the globoid bases. Leaves are a dull to light green, coming out a pale green to yellow green, and recurve gracefully. The leaves of this species are flat, about ½” wide at the base and about 2’-3’ long. Indoor, sun-deprived plants will develop abnormally twisted and lengthy leaves up to 5’ long. This species tolerates extremely humid conditions, low light, minimal to no fertilizer and many other forms of ‘abuse’. This is probably one of the easiest-to-grow tree/shrub there is. 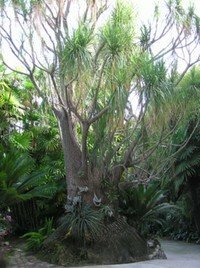 Beaucarnea stricta, also from Mexico, is a much less graceful species, having a thick trunk, deeply fissured bark and leaves that are narrow, stiff and very grass-like in appearance. The do not recurve at all and are only about 2’ long. 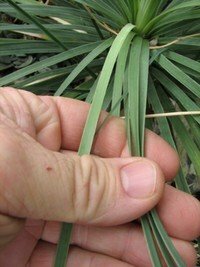 These plants will develop nice fat bases and tall trunks topped off with the tufts of 'grass-like' leaves. 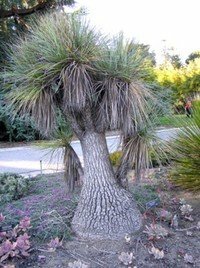 However, unlike Beaucarnea recurvatas, there is a more gradual tapering of the base to the trunk, and the trunks are much thicker and sturdier in this species. The wood of this and the other more desert species is markedly patterned with deap, geometric grooves. Flowers look very similar (as they do in all the Beaucarnea, and even some related species). 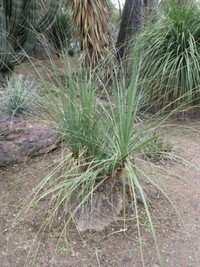 Beaucarnea gracilis looks a lot like B stricta, and I personally cannot tell them apart. The latter supposedly has more glaucous leaves but still very grass-like and stiff. 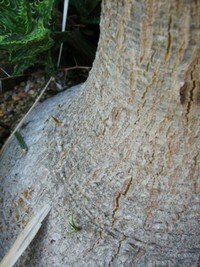 Trunk and base are extremely ornamentally fissured. 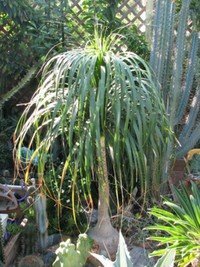 Beaucarnea guatamalensis, sometimes called the curly bottle palm, is from dry areas of Guatemala and Honduras. The leaves are similar in shape to those of B recurvata, but are a bit thinner, shinier and have more red at the base of each leaf where it sticks to the tree. And the leaves are 3’-4’ long and usually twisted. Young plants tend have very maroon leaves when stressed. This species seems to branch from the base commonly, instead of being more apt to form a single trunk as the last two species do. Beaucarnea goldmanii is one of the few Beaucarneas from a wetter, more foresty climate. Yet it still makes a good xeriscape plant. It looks like B guatamalensis, with the curled, thinner leaves, but the heads are rather sparsely leaved. This species is very rare in cultivation. Veterinarian and Exotic Plant Lover... and obsessive, compulsive collector of all oddball tropical and desert plants.